As outlined in our API's requirements, we want to visualize our data in a map, and in a radial histogram that aggregates a metric of our choosing. We will first take a look at producing the API for the map module. For our reusable map module, we obviously want to use it to produce a map for each individual city, and plot the routes and stops for each city. To accomplish this, the module must be able to accept varying data sets, be centered on the city's coordinates, scaled to appropriately display the data points, have zoom capability, and be sized to customize our needs. In addition, later on we want to add some brushing, which will allow us to link the two graphics together for each city. Source code and data files are available in the code/Chapter08/DrawingRoutes/ directory tree. 002:    // Create our custom events, and variables. 013:    // Create and exports function that can be invoked on a selection. 016:    // Bind our custom events to the 'on' method of our function. You may have noticed that in this module, we return a function rather than an object, like we did in our data manager module. We take the approach here (i.e. returning a function and not an object), because this module will be invoked on a D3.js selection. This will allow us to perform standard D3.js DOM manipulation and data binding, thus actually creating our visualization. 001:// Create a center method to serve as both a getter, and a setter. 008:// Create a scale method to serve as both a getter, and a setter. 015:// Create a size method to serve as both a getter and setter. 001:// Create and exports function that can be invoked on a selection. 003:    // Set svg equal to the selection that invokes this module. 005:    // Bind an empty datum to the selection. Useful later for zooming. 007:    // Set the projection up using our scale, center, and size parameters. 012:    // Set the path up using our projection defined above. The exports function above is simply grabbing onto the svg element that calls our module, and setting up our projections. If the projections are already defined, we will us them. If not, we have supplied defaults. 001:// Create a drawRoutes method that can be invoked to create routes for each city. 009:    // Dispatch our routesEnd event so we know with the routes visualization is complete. 001:// Load the routes data and pass our drawRoutes method as the callback to be executed upon data load. 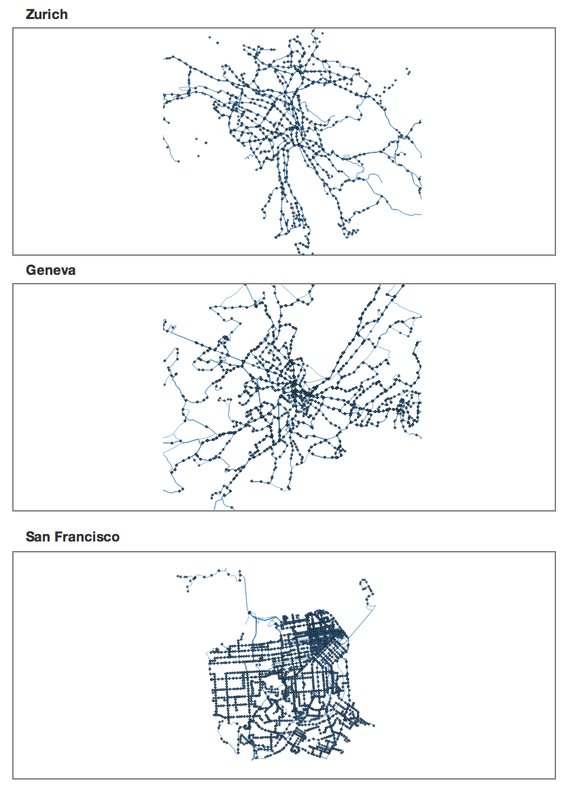 Executing this code will produce the transit routes for Zurich as shown in the image below. Applying a little bit of CSS (style sheets) produces something a little more appealing. The source code and data files are available in the code/Chapter08/DrawingStops/ directory tree. 001:// Create a drawStops method that can be invoked to create stops for each city. 012:    // Dispatch our stopsEnd event so we know with the stops visualization is complete. Just like the drawRoutes method, this method accepts a single argument, the data to be mapped. For each data point, it will plot a point at using the projection we defined in our exports function. In addition, this method we have added a custom event that will be fired when we mouseover a circle. The definition of how to handle this event can then be defined when we instantiate our mapping module for each instance of the chart. Again, we can apply a little CSS to make things a little more appealing. The source code and data files are available in the code/Chapter08/DrawRoutesAndStops/ directory tree. 001:// Load the routes data and pass our drawRoutes method as the callback to be executed once the data loads. 003:// After the routes have been rendered, render the stops. 005:    // Load the stops data and pass our drawStops method as the callback to be executed once the data loads. Source code and data files are available in the code/Chapter08/CombineTheMaps/ directory tree. 001:// Define our width and height for our visualizations. 004:// Instantiate our data manager module for each city. 008:// Instantiate our map module for Zurich. 013:// Instantiate our map module for Geneva. 018:// Instantiate our map module for San Francisco. 023:// Bind our modules to the DOM. 042:// Load the routes data and pass our drawRoutes method as the callback to be executed once the data loads. 044:// After the routes have been drawn, draw the stops. 046:    // Load the stops data and pass our drawStops method as the callback to be executed once the data loads. 050:// Load the routes data and pass our drawRoutes method as the callback to be executed once the data loads. 053:// After the routes have been drawn, draw the stops. 055:    // Load the stops data and pass our drawStops method as the callback to be executed once the data loads. 059:// Load the routes data and pass our drawRoutes method as the callback to be executed once the data loads. 061:// After the routes have been drawn, draw the stops. 063:    // Load the stops data and pass our drawStops method as the callback to be executed once the data loads. As you can see above, we have instantiated a data manager module, and a mapping module for each one of our cities. We then add an <svg> element for each city, and call the mapping module. As we know, this will grant us access to the <svg> element via our exports function, and allows us to render the routes and stops, once the data loads. Using our data manager module, once we see that we have loaded the data, we call our drawRoutes and drawStops methods, to render the charts. Now that we have our basic data manager setup, and have produced a map for every city, we need to start making sense of the stop metrics that we have in our data sets. To do so, we are going to want to produce some aggregate statistics that are common among all cities so that we may compare them. With data sets as massive as ours, filtering, grouping, summing, and averaging the data can be a monumental tasks. Fortunately, there are some great libraries out there that make this task much easier for us. We can integrate these libraries into our own custom API to abstract the heavy lifting that these libraries do and make the interface with our module consistent with the rest of the application, as shown in the next chapter.